The experienced staff at XEX is here to help you look your best on your wedding day. Trust in us as we bring out the most beautiful in you and the rest of your wedding party. Your individual needs will be met in a caring and kind fashion. Relax. Let us pamper you on your joyous occasion. Give us a call at 312-372-9211 to discuss your needs. 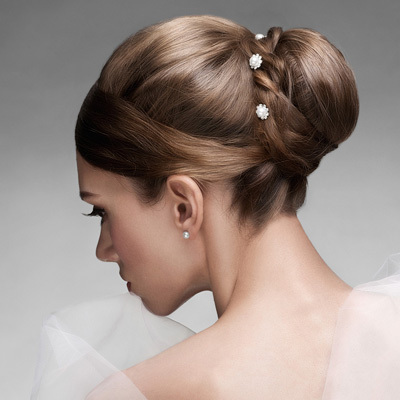 We recommend the bride schedule a hair and make-up trial in the salon. On the wedding day, the Bride is a one hour service for hair and 45 minutes for make-up. Each attendant is 30-45 minutes for hair and 30 minutes+ for make-up. We have a one hour minimum for out-of-salon services per technician. +15% gratuity added on total amount of services. If necessary, a travel fee will be provided upon consultation. Ready to for XEX to help make your wedding perfect? Click here to contact us or call us at 312-372-9211.